Calcium is the most abundant mineral in the human body, which contains approximately 1.2 Kg, 99% of which is stored in bones and teeth, with the remaining 1% present in the blood and other bodily tissues. Calcium cannot be absorbed from the digestive system without vitamin D, which is made in the skin in response to sunlight. 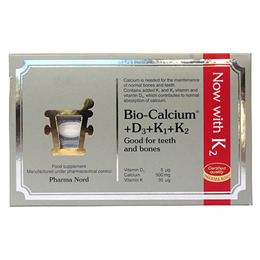 Vitamin K promotes the uptake of calcium into bone tissue. Many adults receive just half the amount of calcium they require from the diet each day. Calcium supplements are available in a variety of chemical forms, most commonly calcium carbonate, calcium citrate, calcium gluconate and calcium phosphate. The elemental calcium provided varies with chemical form, e.g. calcium carbonate provides 40% elemental calcium, whereas calcium gluconate provides only 9% elemental calcium. Calcium is responsible for maintaining healthy bones and teeth. Calcium is important for the maintenance of a healthy heartbeat, the transmission of nervous impulses and the contraction of skeletal muscles. Calcium also promotes healthy blood clotting, healthy blood pressure, and wound healing. In addition, each tablet contains vitamin D3, which can promotes calcium absorption from the small intestine, and vitamin K which can help stimulates the formation of bone tissue. Calcium carbonate, Sweetener: Sorbitol, Anti-Caking agent:Polyvinyl Pyrrolidone, Sweetener: Xylitol, Glazing Agent: hypromellose, Anti-Caking Agent: Magnesium Stearate, Flavouring Enhancer: Peppermint Powder, firming agent Sillicon Dioxide, Vitamin D (Cholecalciferol), Vitamin K (Phytomenadion). Take 1- 3 Tablets daily with food or as professionally directed. Very high intake of Calcium (greater than 2500mg/day) may cause gastrointestinal disturbance in susceptible individuals, interfere with the absorption of zinc, magnesium and iron. Calcium should be taken with caution by patients with thyroid/kidney disease or a susceptibility to kidney stone formation. Calcium should not be taken with Verapamil. 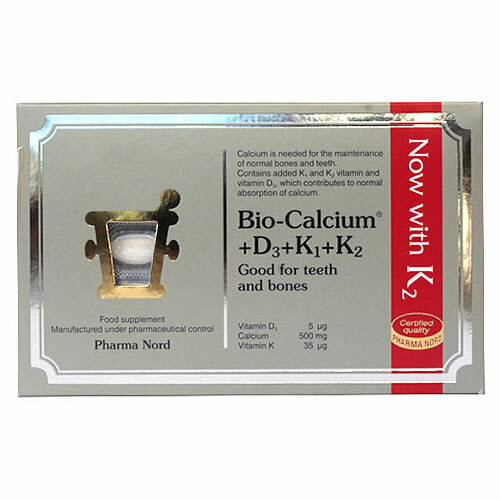 Below are reviews of Pharma Nord Bio-Calcium + D3 + K1 + K2 - 60 Tablets by bodykind customers. If you have tried this product we'd love to hear what you think so please leave a review. Calcium is needed for the maintenance of normal bones and teeth. Contains added K1 and K2 vitamin and vitamin D3, which contributes to normal absorption of calcium.